LightFactory output to the DMX512 standard and supports the RDM extensions. Unlike other software based lighting controllers LightFactory does not lock you onto a hardware platform. LightFactory supports many different output devices and protocols. In LightFactory you can also mix and match the hardware per universe of output. LightFactory supports broadcast and unicast data transmission of Ethernet protocols. Unicast transmission significantly improves network load on your switching devices. LightFactory can also utilise multiple network cards in your PC to load share network traffic. 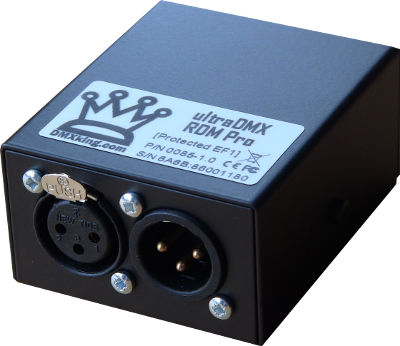 The DMXking.com ultraDMX RDM Pro product is a robust single universe bi-directional isolated DMX512 interface communicating with the host computer over USB. An onboard Atmel microcontroller ensures complete timing accuracy and no flickering effects no matter what your computer is doing. RDM functionality is also available by default. 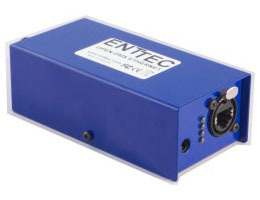 The DMXking.com eDMX4 product is a robust 4 universe bi-directional DMX512-A interface communicating with the host computer over Ethernet. Firmware v1.0 supports the widely used Art-Net broadcast and Art-Net 2 unicast protocols. Born from the Open DMX USB interface the PRO version is the ultimate USB DMX adapter for all computer based lighting needs. The pro is the fastest interface available with frame rates of up to 850 frames per second and is supported by all common operating systems. Micro processor enabled, 1500 V full isolation (data & power lines to protect your computer from surges), 1 Input & 1 Output connector (there is only one DMX port though), RDM enabled. 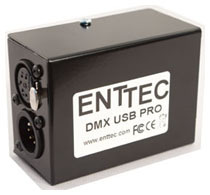 Born from the Open DMX USB and DMX USB PRO, the ODE is the industry's first affordable DMX Ethernet gateway. Out of the box, the ODE is configured as an Art-Net output node on universe 0:0 but can be easily and quickly changed using the free NMU tool. This means there are no dip-switches or thumb wheels to worry about on the ODE. The ODE is perfect for distributing DMX signals over Cat5 in a cost effective manner or with wireless ethernet systems. 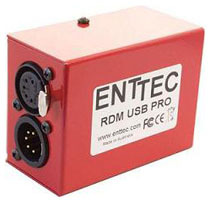 Born from the Open DMX USB interface the RDM PRO version is the ultimate USB DMX adapter for all computer based lighting needs including RDM capability. The pro is the fastest interface available with frame rates of up to 850 frames per second and is supported by all common operating systems. Supports RDM ANSI(E.120) ESTA Fully. Micro processor enabled, 1500 V full isolation (data & power lines to protect your computer from surges), 1 Input & 1 Output connector (there is only one DMX port though). The Datagate is an extremely flexible bridge between control and fixtures/dimmers. It can form the backbone of a network, provide optical isolation, merge levels from multiple streams, and translate between DMX and Ethernet protocols. DMX Hub/Splitter, DMX Merger (HTP or LTP), DMX -> Ethernet, Ethernet-> DMX, RDM Gateway, RDM Sensor Info Gather / Report, DMX shifting, Simple Scene Playback or Test Frame Generation, Hot Spare for another Datagate, or any combination of the above. The ENTTEC Playback wing is the perfect add on for Lightfactory. The wing is ethernet based and many can be connected letting the user customise his or her layout as they want. Ethernet Interface • 40 High quality Cherry MX Keys • 10 High Quality 60mm Faders • 2 Digit 7 Segment LED display • PAGE UP & PAGE DOWN Keys • Large GO & BACK Keys • Upgradable firmware. The ENTTEC Program wing is the perfect add on for Lightfactory. The wing is ethernet based and many can be connected letting the user customise his or her layout as they want. Ethernet Interface • 62 High quality Cherry MX Keys • PAGE UP & PAGE DOWN Keys for Encoder • 9 Window Keys • 25 Operational & Function Keys • 19 Key Numeric Keypad • 4 Arrow Keys and Backspace • 3 Rotary Encoders • 4 line 20 character LCD Display • Upgradeable firmware. This is an advanced DMX512 interface, compatible with most popular control applications for DMX512 control and monitoring. Using technology from our advanced interface for reliable control. Two command sets are supported to give ultimate flexibility. 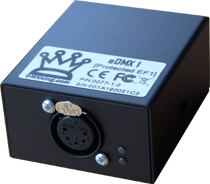 The DMX-TRI provides a rock solid and regulated DMX512 output. 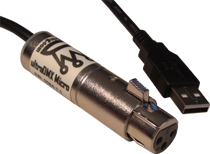 Available with Standard 5 Pin DMX or Popular 3 Pin XLR connector. Developed especially for RDM control with integral RDM protocol engine, on-board discovery and protocol error handling. Providing the precision timing required to efficiently manage the requirements of the RDM standard E1.20-2006. The RDM-TRI provides all the resources required by RDM Controller PC Applications. Naturally, all standard DMX512 operations are supported. 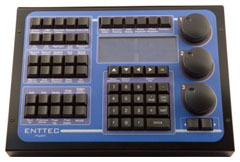 The RDM-TRI is supplied bundled with the GetSet RDM Controller Software as the RDM Control Package. The most comprehensive combination of stand-alone show playback, architectural features, show control and web-based integration in a single, easy-to-use package. CueServer is a unique lighting control solution. At it's heart, it's an Ethernet-based lighting console with all of it's controls accessible via easy to use built-in web pages. Additionally, CueServer is a powerhouse of stand-alone architectural and show control features that can be mixed together to produce elaborate playback systems. CueServer is perfect for many lighting control applications, such as LED displays, architectural lighting, retail projects, museum attractions, theme parks, trade show exhibits, sign animation, churches, water fountains and much more. CueServer easily scales from the smallest single-fixture project to large-scale networked solutions. CueServer provides features not found in other lighting playback devices such as complete web-based operation, which means that nearly any PC, Mac, or even your iPhone or touchscreen iPod can connect to CueServer and turn it into a full-featured wireless lighting console or remote focus tool. Use CueServer as a simple stand-alone playback controller, or as an architectural lighting processor, or as a show controller or even a wireless remote lighting console. CueServer is an elegant platform for flexible lighting control that can be customized to suit the needs of system integrators, lighting technicians, consultants, show programmers, automation experts and more. The new XK-24 with MacroWorks 3 software combines the tradition of rugged, reliable X-keys with added features for the same price as our X-keys Desktop. With four more keys in a smaller footprint, the XK-24 sports a new co-injected case suitable for handheld applications. Clear key lenses keep your printed or hand written legends securely in place and protect them from wear while making it quick and easy to update them. The full travel keys have the same feel as your standard keyboard. 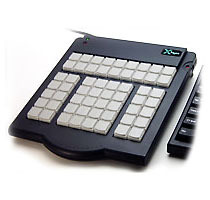 A wide variety of key caps and key blockers make it easy to customize the XK-24 into a simple control surface like a bump bar or a live audio switcher. It's like a speed dialer for your computer. 58 User-reprogrammable keys. One button access to shortcuts. Easily create your own macros Programs in a language every computer user understands -- keystroke. Customize your X-keys with keycaps and key blockers. Whether you are a Graphic Designer, an Architect, a Web Manager, or a Two-finger Typist, proficiency in your software requires rapid input. Keyboard Macros and Hot Keys offer the shortest path to action, and the X-keys provides a clearly labeled, physical location for these complex or redundant functions so you don't have to think about them. The X-keys lets you focus on the project instead of the process. 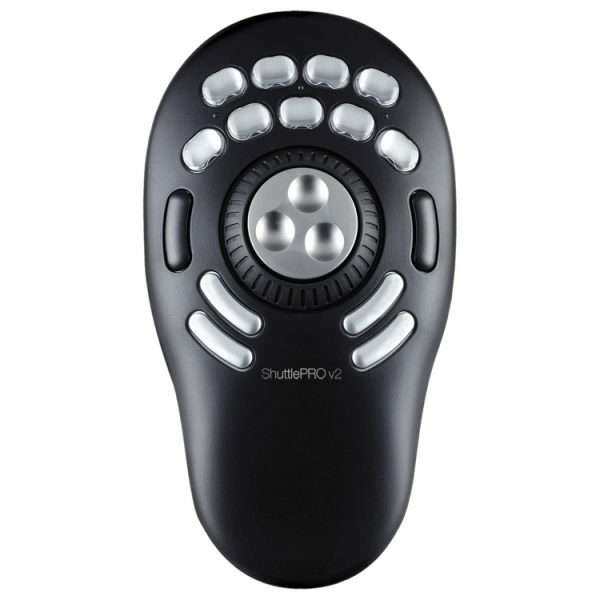 Contour ShuttlePRO v2 is the perfect productivity accessory for Lighting control on a PC. Working with your mouse, ShuttlePRO v2 is designed to minimize keyboard confusion and improve workflow with its innovative design and intuitive range of controls. 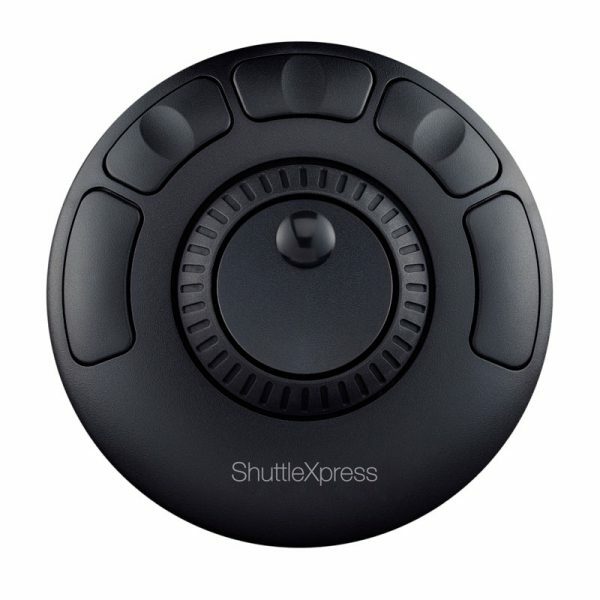 ShuttleXpress is the compact version of the multi-media controller, ShuttlePRO v2. 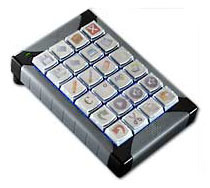 With five buttons, a jog dial and Shuttle wheel, ShuttleXpress is a compact attribute controller for LightFactory.